This is my first post but I have been a long time fan of all the helpful people out there on these forums. I have been researching how best to improve my home's current network wiring. Having no formal knowledge most of what I have learnyt recently has been picked up from reading various blogs, articles, wiring codes, and of course GZ forums. As it stands my house currently has a standard ISP issued vodafone modem/router and Cat3 running everywhere for the phone wiring (and half the jackpoints don't work). So, plan is to bring my home out of the dark ages into the 21st century. I have drawn up what I think I need to put in place in terms of structured wiring but please feel free to comment with suggestions etc. Looks perfect to me thats the easy bit now u need hardware got your shopping list sorted? Welcome to Geekzone - that's looking pretty good. Perhaps consider using a separate router and wireless AP(s), unless it is a fairly small building, that way you can run an ethernet cable to a suitable point for wireless distribution, and leave the router at your patch panel. Make sure you run more cables than you think you will need - cable is pretty inexpensive in comparison to the cost of installation if you are already opening up walls or getting cable through difficult areas. Also, for hard to get to areas, ducts with draw wires are very useful. And, in hindsight I should have put some rj45's into a few wardrobes with power too. Good for stashing a printer or media server away. "Perhaps consider using a separate router and wireless AP(s), unless it is a fairly small building, that way you can run an Ethernet cable to a suitable point for wireless distribution, and leave the router at your patch panel. " Good point, I'll add it to the map. With the Test point, I can't seem to find out where it should go. Is it merely used to test telephone only and could therefore go after the master splitter? Or does it need to be before the signal is split? The test point comes first on your line. Do you have one already? Master splitters are sized so they can be installed inside the test point. Depending on what physical hardware you decide for your patch panel etc. you could use one of these to provide a test location. Thanks for confirming where the test point should go. In terms of cabling, I was going to source most of what I need from Cables Direct NZ. Ideally, I'd like to run Cat6 for obvious reasons but I have had a range of people say that for a simple home network it isn't necessary. sabrewarri0r: Thanks for confirming where the test point should go. I thought Cat5E did gigabit? This link suggests it does. Though no real downsides other than a slightly higher cost, and it's less flexible. Don't need cat6 to do gigabit, but in terms of future proofing, may as well go for it anyway. Other (non network) services like HDMI and so on may need Cat6 as well. Ok, so this is where my noobness comes into play. 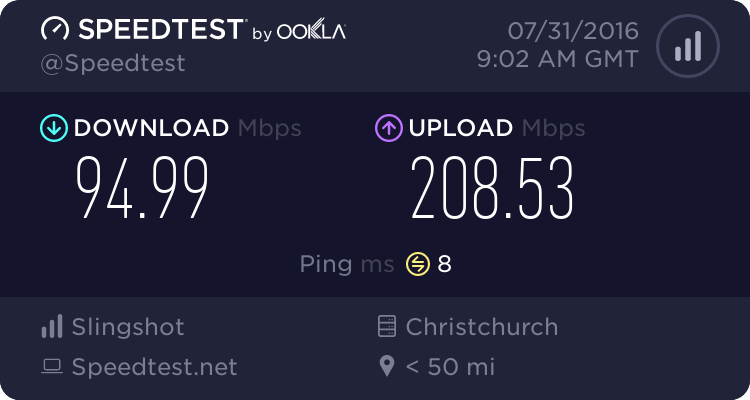 We're still only on ADSL2+, fibre hasn't been run to our area of Auckland yet. I suppose I could always move onto VDSL. In terms of the home network what determines if you need gigabit speed? timmmay: I thought Cat5E did gigabit? This link suggests it does. Though no real downsides other than a slightly higher cost, and it's less flexible. And a bit more of a b*tch to terminate etc. Not sure why anyone would need 10GE at home. I did put in Cat6, just because I could, but mine are relatively short point to point runs not a full fitout. timmmay: Not sure why anyone would need 10GE at home. I did put in Cat6, just because I could, but mine are relatively short point to point runs not a full fitout. you wouldnt right now, but im just talking about future proofing. im sure if you went back in time and told someone in the 90's to put in cables for gigabit ethernet they'd have said the same thing, might as well get it all done now.